See scan - absolutely perfect condition. this is an extremely rare Romanian / Rumanian socialist / communist era pilot cosmonaut / astrounauts space flight uniform badge with an eagle holding the Earth globe in its claws and a rocket circulating it. The eagle is surrounded by a wreath. It is a very nice and large badge. 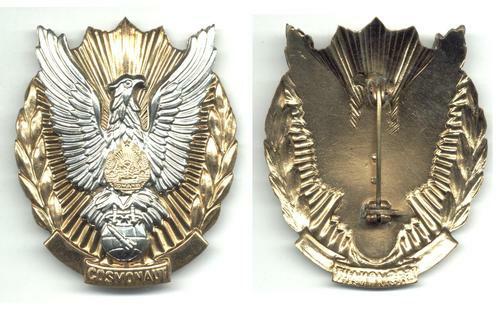 This is the first time I see this one and although it is a replacement piece it is an insignia that is extremley hard to find. Absolutely scarce space exploration militaria / military collector piece and one of the rare modern Romanian badges. The cosmonaut was Dimitry Prunariu and he flew the Soviet Russian USSR Souyz 40 spaceship / craft.